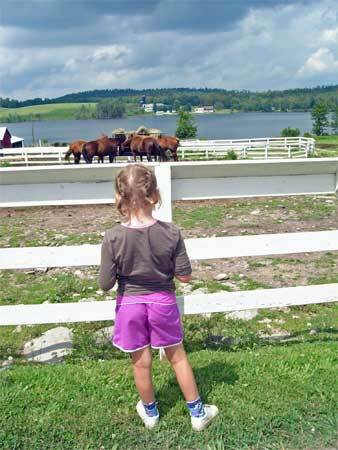 My girl in braids watching the horses at Duck Harbor Pond. Last week I slept in my bed exactly 2 times. Every other night was spent sleeping on the ground somewhere in Pennsylvania with my kids, husband, family and friends. We packed 3 camping trips into a week and a half, and my kids still didn’t want to come home. That makes me smile. I’m glad they enjoy the outdoors as much as I do. A few of those nights involved a trip down memory lane as the kids and I camped with my parents at a lake in Wayne County. Our connection to this lake reaches way, way back. My mom vacationed there as a kid. When she had kids, she brought my brothers and me to the lake, as well. We refer to it as “going to the mountains.” My son is the first to question why we call it “the mountains.” He also wanted to know if there would be snow there. Not in July. We do the normal stuff you do on an outdoor vacation…boating, fishing, hiking, hitting trees with sticks, playing lots of games (Traffic Jam, badminton and chase being the favorites right now), catching lightning bugs and picking flowers. Of course the bugs love us, too. As I write this, a mosquito bite on my big toe is particularly itchy. And this time we had an unfortunate encounter with ants. One other game we play is guessing how many deer we’ll see as we drive around each night looking for all manner of wildlife that may be moving about at dusk. This tradition started out many years ago as a way to scope out deer for the hunters in my family. As we drove about the bucolic areas of Wayne County looking for deer and rabbits (we even saw an egret! ), watching one farm melt into another, I realized the origins of my fascination with farms. Maybe this is why I long to live in a stone farmhouse or converted barn. This is where my admiration of stone fences came from. This is why I love horses and cows and sheep and all things animal. The lake where we play is home to a bustling horse farm and a cow farm. As a kid, daily I walked down the dirt road to the horse farm to check on the foals. This is where I stole a pat on the head from a horse curious enough to come to the fence. As I got older, I worked hard at home to earn money to buy a $13 trail ride from a another farm a car ride away. I scooped dog poop and painted, mowed grass and picked up sticks (awful job! ), just so I had enough money to take a trail ride or two in the week we spent at the lake. I still remember the day my mom got on a horse and proceeded to get right back off. She was NOT going to ride a horse. That farm still has horses, although the house we called “Little House on the Prairie” is gone, and it doesn’t seem they give trail rides anymore. Too bad for my little budding horse lover. P.S. Don’t forget you need to pre-register if you want to attend Sunday’s horse hair jewelry class at the Museum of Indian Culture. Click here for more details. This entry was posted in About, Horse Hair, Jewelry, Kids, Nature and tagged horses, Nature, vacation by Susan. Bookmark the permalink.